Our organization asks cooperative travelers going abroad to deliver wheelchairs to people who need them. Meeting a receiver with a smile while traveling will be an unforgettable experience for you. When you are going to travel abroad and are interested in delivering a wheelchair, please contact us. If you let us know six weeks before your departure, we will be able to sufficiently coordinate with a recipient. We will ask you about the country you are traveling to, the departure date and the time we can transfer the wheelchair to you. We will coordinate the time and date so that you can directly meet the recipient. We ask you to check the weight allowed for your luggage (free of charge) when you board the plane. 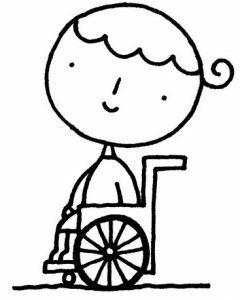 The average wheelchair weight is 15kg for adults and 12kg for children. We will inform you of the exact weight and size of the wheelchair beforehand. 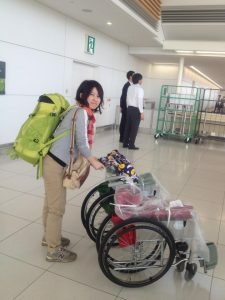 The wheelchair is typically packed for departures from Haneda or Narita airport; therefore, care must be taken when transporting it around the airport. When you want to have a wheelchair delivered to you from an airport in Japan, you will have to pay the additional transportation cost. Please contact us to find out more details. We ask you to directly visit a receiver’s home, facility or hospital to deliver the wheelchair. We hope that you will deliver the wheelchair representing the love and support of the many people who made it possible.